Once spearheading the NWOBHM movement in Sheffield DEF LEPPARD chose a more commercial path around 1982/83. The ensuing album, “Pyromania” secured their success as much as the hiatus following drummer Rick Allen´s car crash and loss of an arm cost them betwixt 1984-87. Those years also included three massive years in the studio creating another success, “Hysteria”. Another massive set back was the suicide of guitarist Steve Clark in 1991. 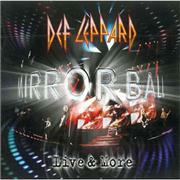 Since 1992 the band has consisted of Joe Elliott, vocals, guitarists Phil Collen and Viv Campbell (ex. SWEET SAVAGE, ex. DIO, RIVERDOGS), bass man Rick Savage, and one-armed drummer Rick Allen. This disc has also been sort of delayed, being the first ever live outing from the band. The most part of the album is made up of songs from their softer halcyon years 1983-1992. The focus may be on their almost poppy blockbusters like “”Rocket”, “Animal”, “Let´s Get Rocked” and similar, but the audience seem to sound more when real classics like “Foolin´”, “Bringin´ On the Heartbreak” and “Photograph” are delivered. The band seems to have fun, and the audience is very active in belting out every old chestnut. The odd choices; the cover of SWEET`S “Action”, and later songs like 2008´s “Nine Lives” and the very odd closing track “Bad Acress” from the same quite ok (but no more) “Songs From the Sparkle Lounge” don´t quite bring down the house. As a whole the live debut on disc by this always in some kind of fashion band is very enjoyable. I understand that they feel the need to play something newer than “Poor Some Sugar On Me”, but fate and the audience wants them to perform the classics and nothing more. After all they have a plethora of enviable hits to choose from! The three new songs are a mixed bag. “Undefeated” gives me goose bumps. It is exactly what DEF LEPPARD is all about to me; the intro, the chorus, the refrain etc. An album of that kind of material would boost sales. I say almost exactly the same about “It´s All about Believing”, which is only a percentage weaker. But “Kings of the World” is another story. If made by whoever makes up the numbers in QUEEN these days it would have been rightfully hailed and cheered. But why DEF LEPPARD makes a carbon copy of another major English music export I can´t understand. I hope it´s a playful little game they play, and not a hint of the future. Anyway, there is a lot to rejoice about on this disc, and I believe it will bring a smile to more faces than mine.